Barbie — despite her permanently lipsticked pleasant smile — has been a controversial character for years as she’s struggled to keep up with the times and branch out of her heteronormative, all-pink-everything life of leisure. And Barbie maker Mattel has often been criticized for Barbie’s beyond unrealistic body proportions — something many have argued have a detrimental effect on young girls’ self-images. In recent years, though, Mattel has given Barbie numerous makeovers — and no, not the “mani-pedi and a blowout” kind. The latest fashion-forward and forward-thinking edition? Two dolls — Barbie and “friend” (more about that later) blogger Aimee Song sporting boxy tees with “Love Wins” emblazoned across them in bright rainbow letters. The real-life Song, whose Barbie version hit shelves earlier this year, designed the “Love Wins” shirts for Pride Month, and fully half of the proceeds of the shirt are donated to the Trevor Project, which supports LGBTQ youth. Song joins the ranks of Misty Copeland and Ibtihaj Muhammad — modern role models who also welcomed their own Barbie replicas this year. 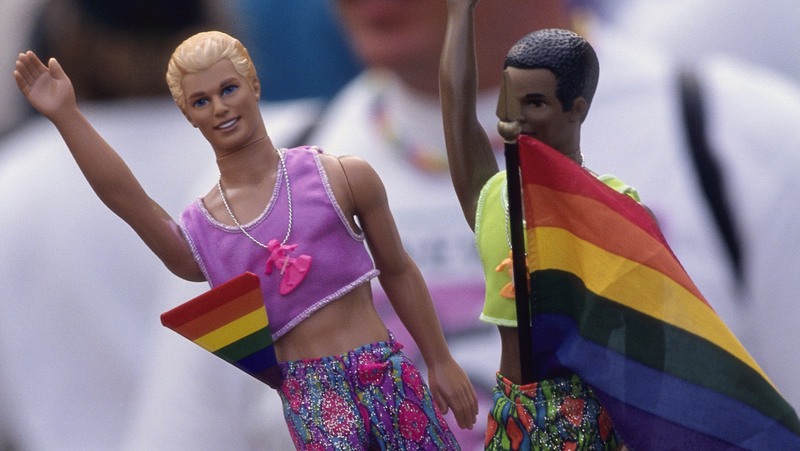 But OK, the lady dolls in “love wins” shirts: Are these (finally) gay Barbies or what? The pair appeared on the official Barbie Instagram (of course Barbie has an Instagram account) and fans cheered the development. “My girlfriend’s daughter and this proud step mom are both OBSESSED with Barbie — thank you for showing us how to win with love and acceptance,” one commenter enthused. “I grew up playing with Barbie dolls and as a member of the LGBT+ community my heart is full with this amazing step towards equality in the media,” another said. The two Barbies in the Instagram pic led some commenters to ask if they’re a couple — if this was a suggestion that Barbie might be (*gasp! *) queer herself. “Barbie has a gf and i don’t? fake news,” wrote one. “Barbie is BIcon, lol Call it Bar-BI,” joked another. “Such an inspiration! This goes to show that even femmes are bi!” said another. Mattel hasn’t officially weighed in on Barbie’s sexuality, but many fans are pleased that Barbie is now at least an official ally of the LGBTQ community. Even if these are the lesbian Barbies we’ve been waiting for, though, they aren’t the first. In 2016, Mattel first delighted, then sorely disappointed, fans by announcing the first lesbian Barbie — in the form of U.S. soccer star and gold medalist Abby Wambach — and then breaking the news that the Abby doll was a one-off for Wambach herself and would not be available for purchase. This was a truly bummer move, especially since Mattel released the Abby doll to great fanfare as part of its Shero line. That leaves us mildly nervous about the recent “release” of the first hijab-wearing Barbie based on the aforementioned Muslim-American Olympic medalist Ibtihaj Muhammad, another addition to the Shero line. Will Mattel refuse to manufacture and sell this groundbreaking doll too? At least Wambach loved the doll she got (I mean, we all did). She said, “All the cool kids are going to want this.” And so they did — and do. Can we give kids the opportunity to own one of these dolls yet, Mattel? @trihardannette This was a one of a kind doll made for Abby and isn't available for purchase. We're sorry for any disappointment! We’d love some answers, but Mattel has remained pretty quiet on the subject. So has Ken, for that matter. Hmm.